I know, I know… I have been out of the game lately. But I am now ready to party again! Hello my crafty lovelies! Welcome to the How Pinteresting! Crafty Thursday Link Up! 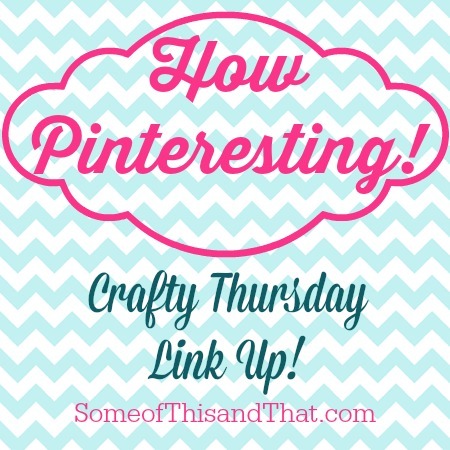 I can not wait to see all of the awesome crafts, recipes and tutorials that everyone has to share each week! Each week I will be featuring some of my favorite posts and will be pinning them to the How Pinteresting board! Visit Some of This and That’s profile on Pinterest. Don’t forget, we love to share the love here and will be featuring and pinning our favorite posts from each week! Be sure to follow us on Pinterest, Facebook and Twitter! Be sure to grab the button to show everyone How Pinteresting you are! Everybody needs rules, but these are simple. Don’t link and run. Give some comment love to at least one other link. Link to a direct post of something you have created. We do not discriminate, share your recipes, DIY, Crafts or tips! Be sure to grab our button or link back to let others know where you party! *By adding your links you are allowing Some of This and That to use your posts in featured roundups and to share on social media. Images will never be altered and proper link backs and credit will always be given! Thanks for hosting. This week I am sharing my Pulled Pork Breakfast Egg Skillet GF DF.